c.1881-1882 as the C.P. Railroad pushed through on its westward trek. Congregations of Presbyterians and Methodists were holding services in homes by 1882. 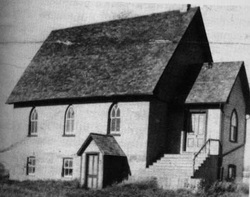 Subsequently, churches were built at Ryerson, St. David's, and Oak Lake. The Town building was not large enough to accommodate the large number of Presbyterian worshipers, and so, services were held in Cameron's Hall- now the Olde Town Gallery - while the present church building was being constructed. 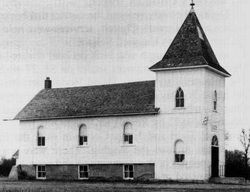 The inaugural service was held November 17,1900. 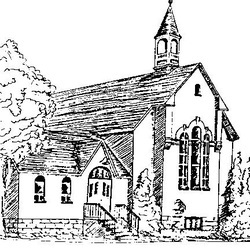 The United Church came in to being in 1925. Locally, many Methodists, Presbyterians, and Congregationalists were already worshiping together, so the Act Of Union seemed a perfectly natural occurrence here. There have been some changes made to the original building through the years. The pipe organ and curtained area for the pumper have been replaced by an electric organ. An office was added in 1984 and in the summer of 2003 a ramp was installed to make the church accessible to all. 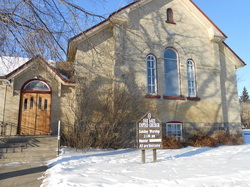 The United Church Women's group is very small in numbers but with help from the community-based Activity Group, funeral lunches are provided and the work of the U.C.W. goes on. Two suppers are sponsored annually - one in May and one in October.